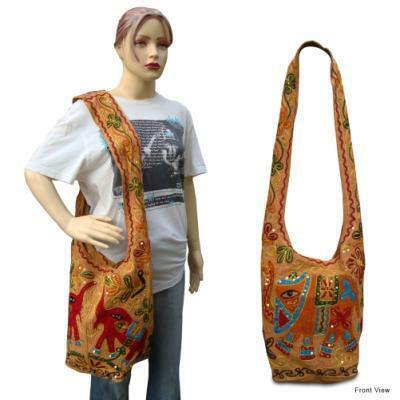 With the support from our competent procurement team, we offer Embroidered Elephant Cotton Jhola Bag. Keeping in mind the latest market trends, our offered jhola bag is designed by using top notched grade material. This jhola bag is widely appreciated amongst our customers for its excellent finish in the market. Offered jhola bag is examined against various parameters to assure the entire range is free from any sort of production defects. Roots of Gs International, the industry leading Manufacturer and Supplier firm of matchless range of Ladies Apparels and Cotton Bags, were dated back to the year 1994. Holding integrity at its core, we are instrumental in broadening our unique and exclusive collection of quality products, which includes Rayon Sundress, Long Rayon sundress, and Batick Sundress. Our line of products is well acclaimed in the competitive industry for featuring wide range of beneficial properties, such as unique patterns, attractive designs, skin friendly fabric, appealing color combinations, and shrink resistance. Since the inception, we are functioning with long term visions and strategies to become the industry leading entity. As an organization, we bequeath our success, to our team members’ proficiency, whose skills and objectives brought us at the fore of the industry. Further, we planned carefully for a sustained growth for the company, by establishing enduring relationships not only with our clients but also with the end users. And, we do this by conducting rigorous market analysis to grasp the current fashion trends. Moreover, our technologically advanced infrastructure is also playing a vital role in enhancing the end user experience. We have installed most modern weaving tools and equipments, which greatly improved the quality and longevity of our offered products.